Last night's easy override of Mayor Bhalla's veto by the Hoboken City Council offered little drama as for the third time a 7-2 vote hands Hoboken voters the decision on whether to bring back runoff elections in November. Yesterday's late news exclusive led to a vigorous discussion when the resolution on runoffs came up for a vote. Councilman Mike DeFusco read the entire text into the record pointing to the politicization of the issue with Mayor Bhalla's veto. Councilman Jim Doyle, who ran on the at-large council slate on the Bhalla campaign was stunned by the reference unaware whether it was a text or email. The discussion would lead to more than 30 minutes of discussion prior to the vote, mostly on the issue of voter fraud in Hoboken. 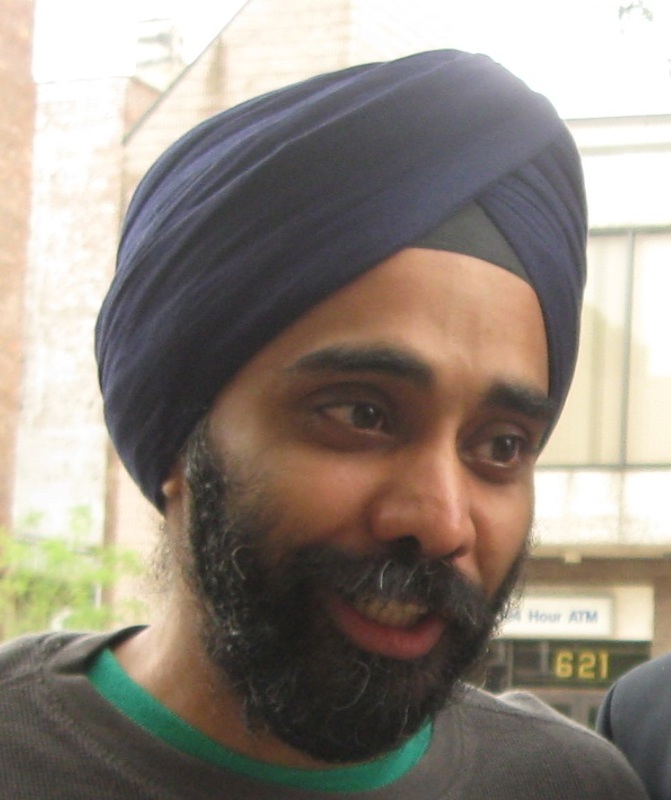 Amar Bhalla, the brother of the Hoboken mayor saw his entire text published on MSV read into the record. 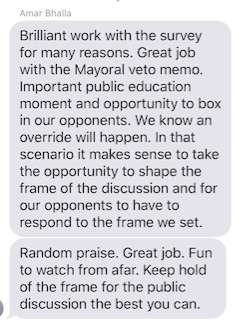 The text highlights an "us vs. them" view on most of the Hoboken City Council deeming them "opponents" and an "opportunity to box" them in by weaponizing the veto even though it's a lost cause. Last December, former Hoboken mayor Dawn Zimmer who backed out of the mayoral race late to insert Bhalla with a simultaneous endorsement on the steps of City Hall last June vetoed the same council ordinance. Her last significant action after two terms as mayor was promptly overridden by the City Council last month. Last night it was Mayor Bhalla's turn. On January 31st, Mayor Bhalla thanked his brother for the earlier text calling for the demonization of the City Council. He also wrote that he's "running this show now." His response offered no admonition for the posture taken against most of the City Council. The three council meetings have been mostly sedate with most of the Bhalla administration efforts on legislation easily passed with the backing of the entire council. After the November election, one of the dirtiest in recent memory, some Bhalla campaign insiders have urged a continuation of scorched earth tactics focusing on three of the good governance council members Peter Cunningham, Jen Giattino and Tiffanie Fisher. The three council members formerly aligned with the deceased Reform Movement and Dawn Zimmer met last month with Mayor Bhalla to share a vision on moving a number of issues ahead. Bhalla insiders have however waged a campaign to see the removed in the 2019 council races. Amar Bhalla responded to his brother Mayor Ravi Bhalla's January 31st text, saluting the response with a reply of "Cool." He then poses a question feigning a joke writing, "You mean the "Shadow" is not controlling you?" The reference to the "Shadow" is coinage from the campaign last year. The term "the Shadow" is thought Dawn Zimmer's husband, Stan Grossbard who became ensnared in the Carmelo Garcia "ethnic cleansing" civil lawsuit. Grossbard had written emails to various board members of the Hoboken Housing Authority when Garcia was the Executive Director of the agency. The emails became a political lightning rod in the case and in late 2015 when two public speakers were thrown out of the meeting for mentioning his name with the emails referenced in a PolitickerNJ story. The lexicon of referencing the "Shadow" has continued after the election and often surfaces on the Hudson County View. In the Amar Bhalla text, he sarcastically jokes about his brother the new mayor being controlled by former councilman Mike Lenz, fanatical pro-Bhalla blogger Nancy Pincus and Councilwoman Tiffanie Fisher. The mayor's office was contacted but has not offered comment on this breaking story. Another party on the text exchange is confirmed as John Allen, the Chief of Staff to Mayor Bhalla. Talking Ed Note: The Bhalla administration's efforts to get the public to back the veto backfired. Only one resident, a lawyer came out voicing support last night for Mayor Bhalla's veto. Numerous Hoboken residents spoke in favor of the November referendum, some dually voicing support for the idea of instant runoffs. A resolution last night was passed unanimously by the City Council backing those efforts saying the council should push state approval to the idea. Why did Ravi Bhalla throw speakers out of a council meeting? Hudson County View filed this report on the council meeting and noted Councilman Mike DeFusco highlighting a portion of the text messages published here. The mayor's office issued no comment and didn't challenge the authenticity of the text exchange with another source stating it was accurate. Ignoring the weaponization of a wasted veto, Mayor Ravi Bhalla is quoted as declaring nuclear war - on everyone. He claims council members Peter Cunningham, Jen Giattino and Tiffanie Fisher "have chosen to align themselves" with council members Mike DeFusco and Ruben Ramos "and other beneficiaries of voter fraud." Mayor Bhalla then concludes his latest scorched earth tactics saying, "Their conduct speaks for itself." This is the exact narrative Hoboken has heard from the Shadowy commenter repeated over and over at Sybil's Cave since the election. The scorched earth smear tactics deployed by the Bhalla campaign are being embraced from City Hall after only three fairly smooth council meetings. Based on easy to do math; more than a few comments at the meeting last night pointed out that voter fraud is far more problematic in a multiple candidate field than a two member runoff. This is obvious to any observer with any basic arithmetic skills. Talking Ed Note Update: Someone may suggest a remedial math class for Mayor Bhalla and his "Shadow." This type of rhetoric has been a staple of the insiders and political operatives at Sybil's Cave but Hoboken expects more from those who deem themselves a bit smarter. Hoboken certainly deserves better. 32% of Hoboken voted for this extremist rhetoric so expect more of it. Sad!